Doing your own squarefoot gardening has a number of advantages. I have used the squarefoot gardening method myself, and found that it is perfect for the beginning gardener, and for the small gardener who wants to avoid a lot of hassle. By following Mel Bartholomew’s advice in All New Square Foot Gardening, you can avoid a number of the difficulties in gardening. Restoring microbial life to the soil. This life is known as "the soil food web"
Mel’s mix gives you a nearly perfect soil right from the start. The components of Mel's Mix (which is 1/3 vermiculite, 1/3 peat moss, 1/3 compost) are readily available at your local garden center. Mel's mix is nutritionally balanced, holds moisture well, and contains no weed seed. Once you have your box filled with Mel's Mix, each time you replant a square foot in your garden you just add a scoop or two of compost. You never have to add in any more vermiculite or peat moss, only compost. Best of all, Mel shows you how to easily make the compost yourself, from readily available materials. The soil in your back yard is probably filled with weed seed. When you use Mel’s mix, or if you just use compost as soil, it contains no weed seed. With properly prepared compost, weed seed is consumed by the microbes in the composting process. This means that the only weeds you will have are from seed carried in by the wind, which is almost none. If a weed does show up, just pluck it out. How easy is that!!! Vermiculite and peat moss do a great job holding water. Therefore it isn't necessary to water as often. Many times watering once a week is enough. Over watering is one of the easiest ways to kill a plant. Because of the components of Mel's mix, even if you do over water, the excess water will just drain out the bottom of your box. 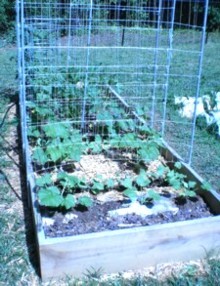 Square foot Gardening saves you from the possibility of killing your plants by over watering. 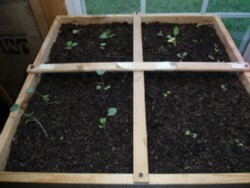 For information on how to make your own square foot gardening boxes, and how to make the “perfect soil” called Mel’s mix, click here. For square foot gardening tips, such as growing crops vertically, packing your produce full of nutrients, using a portable garden, and making room for sprawling crops, click here. Learn about using squarefoot gardening to grow more in the space you have, planting for a continuous harvest, and ways to safeguard against pests. Also at this link, you can view pictures of my square foot garden greenhouse. One of the best kept gardening secrets I know is the value of micronutrients. The best source of micronutrients is concentrated sea minerals from the ocean. Ocean Trace is the micronutrient product I rely upon in my garden. 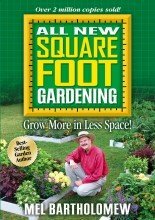 If you are just learning to garden or if you don’t plan on growing a large garden, Squarefoot gardening may be for you! You can avoid many of the problems associated with a "row" or "raised bed" garden by ordering All New Square Foot Gardening and following Mel's advice.